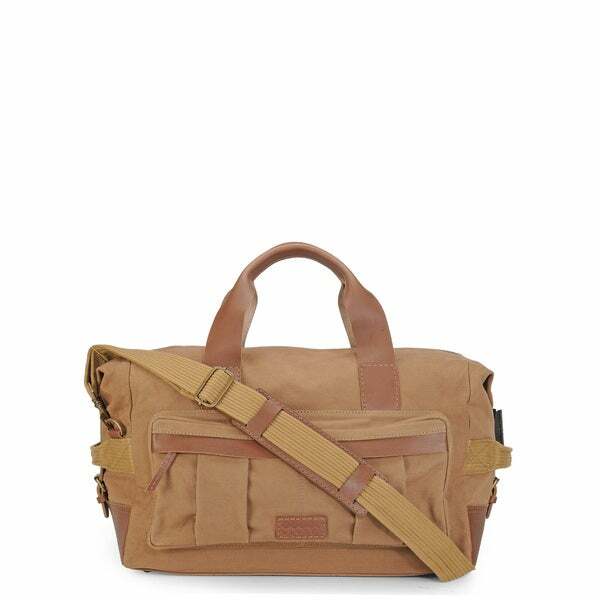 Durable canvas and good quality genuine leather, double reinforced grab handles, external pocket, reinforced base to maintain shape, zip fastening, inner utility pockets for smaller items and more, comprise this sturdy mens duffle from Phive Rivers. Stylish and durable canvas pleated front pocket adds a masculine touch to the overall look. Story Behind the Art: Our creations are untouched by machine, and crafted by men. each one of our five artisans is allowed togive his full attention to the minutest element. from the texture and grain, to the size and width, no part of our material is left without scrutiny. genuine leather is clipped with unwavering precision a thousand times over till theperfect cut is realized. every piece is mancrafted by hand, in our own distinct style, with a delicate finesse that moulds separate pieces of our exquisite natural leather together as one, giving that unique look. setting leather trends has been our creed and it's a belief that reflects in all our distinct designs. we bring you the best in fashion every month, with moods, trends and silhouettes inspired from the fashion ramps in milan, paris, berlin, london, new york and tokyo. Gift the traveler on your Christmas list things that help make life on the go easier. Let us help you pick the perfect gift for him with our top 10 favorite handy and stylish gifts for the traveler.